I think I'm pretty tired of government red tape at this point, especially with a possible government shut down looming. I went over to the US Fish and Wildlife Services website and dug up the contact form and sent them a message about the shortage of Kolinsky Brushes. 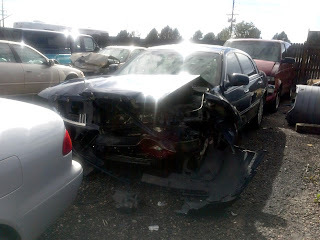 Here is what I posted. I tried to keep it as reasonable as possible. I am currently having problems buying paint brushes made from Kolinsky hair (which comes from the species called mustela siberica). After researching the problem on the internet it has come to my attention that the US Fish and Wildlife Service has stopped these shipments by insisting that the Country of Origin Document be on a CITES form. I fail to understand why this decision was made when the old documentation provided by UK and European sources was okay before. According to NAMTA the information is the same so requiring a new form makes little sense to me. I fail to understand why this documentation issue cannot be worked out and the supply of Kolinsky brushes restored. My sources in the US are completely out of stock of the brushes I purchase on a regular basis. 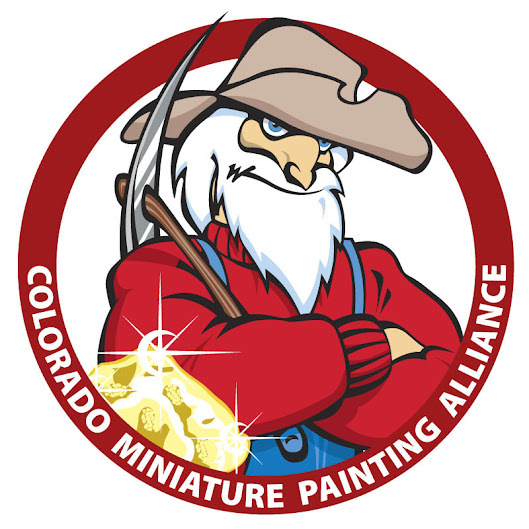 This is beginning to have an economic impact on Art suppliers in the US which is never a good thing and impacting my ability to pursue my hobby. Believe me there is a huge difference in brushes and you are keeping the supply of premium and highly sought after brushes off the US market. It was either this or poor Hobbes is going to start losing fur! A note of warning; this post does not have anything to do with cruelty to animals. I simply want to get brushes that are already in production back into distribution in the US not to discuss the moral or ethical viewpoints of how those brushes are made. I will delete posts that try and start that discussion. Hobbes is not in any danger of being shaved anytime soon. 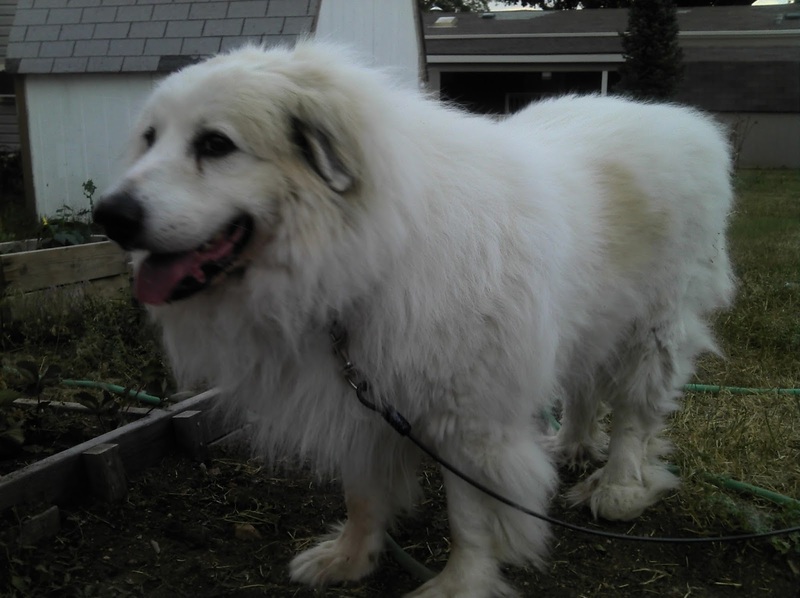 Besides his fur would make a poor paintbrush. The top coat is nearly waterproof and the undercoat is much to fine. Labels: Kolinsky Brushes, Kolinsky Sable, US Fish and Wildlife Service. I was asked in the comments section of one of my posts if I had seen the Burn In Design western buildings. I actually have several of these buildings, most of which I haven't completed. While they are still a quality product they just don't fit in with the buildings from other manufacturers. In fact I don't think they are designed for our 28mm miniatures. I half believe that these are actually 1/48th scale or pretty close to it. 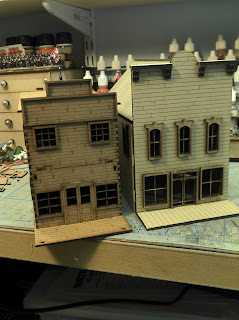 I didn't even finish the simplest of the buildings that I bought. 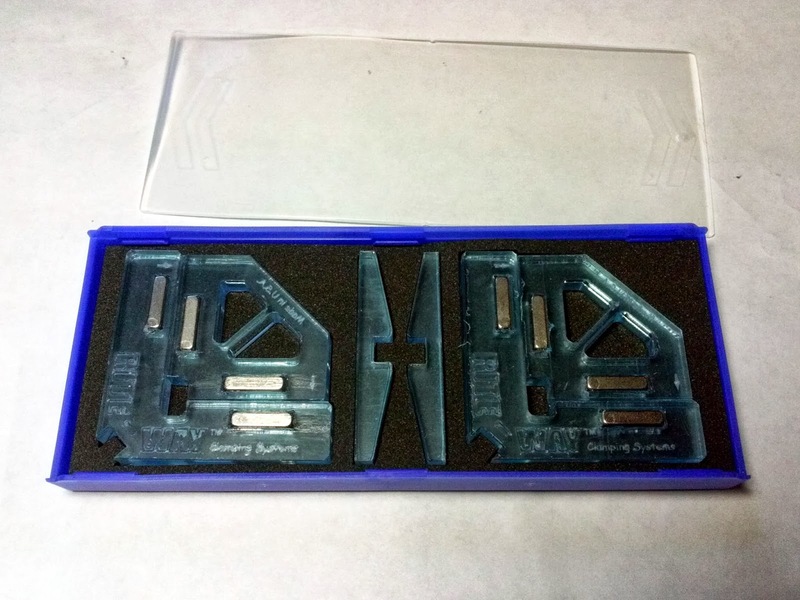 These are still quality laser cut products so if they will work for your gaming needs then I would recommend them in that respect. They just don't work for me. They also hit me in one of my biggest pet peeves when it comes to laser cut buildings, no instructions. 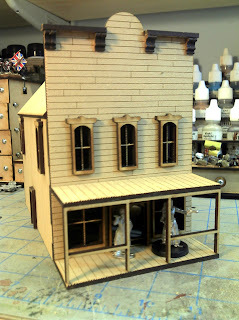 Now the little saloon should have been a snap to put together even without instructions but I still couldn't quite figure out how everything was suppose to go together and I gave up in complete frustration with one of the two story buildings. Now I fully admit that my patience level was probably not set to its usual level since I already knew that I wouldn't be able to use these. I snapped a few pictures with my favorite female huckster from Reaper Miniatures as well as one of my mounted Norman knights that I need to repaint. Last Thursday, the day after the rains started (beautiful today though) my younger son was in a bit of a fender bender. 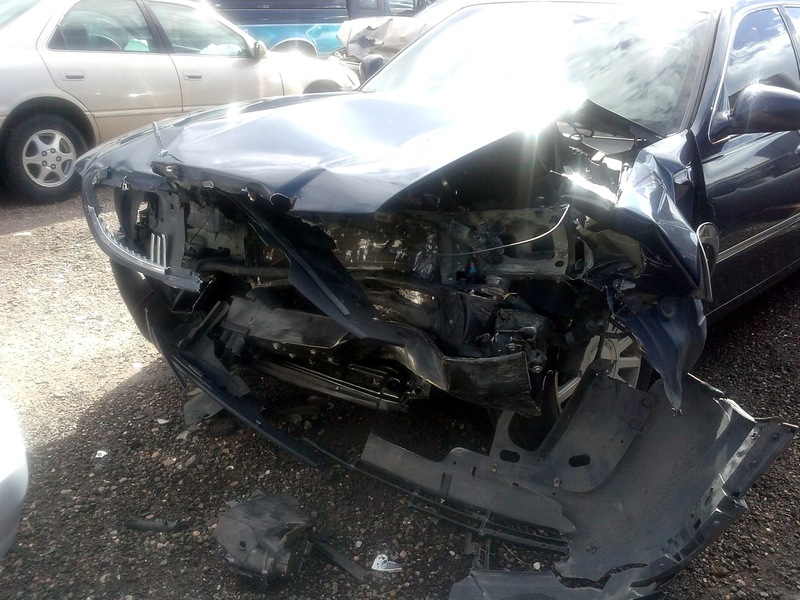 Fortunately he is fine, sore, but fine and he wasn't at fault either. 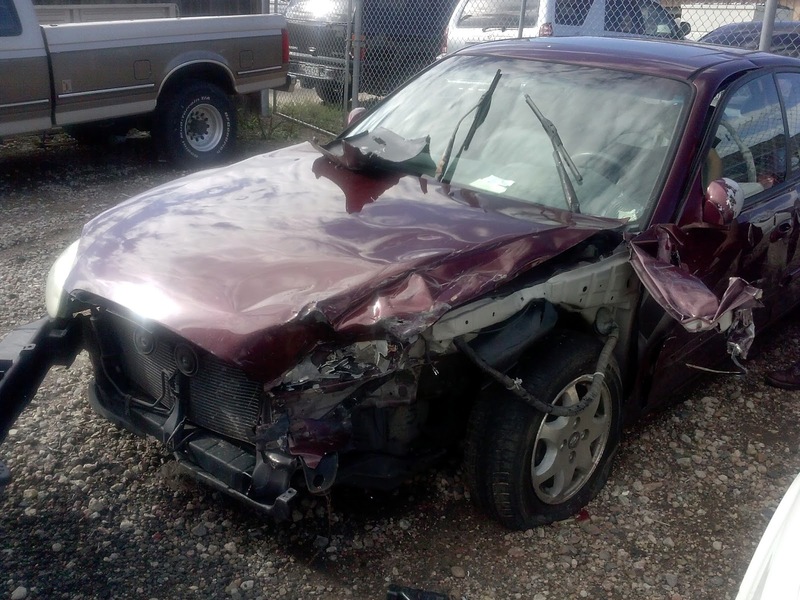 Remember, turning traffic never has the right away unless its a green arrow! The gentleman that hit Alex had his vision obscured by a car in the other turn lane, Alex was going straight through on the green. 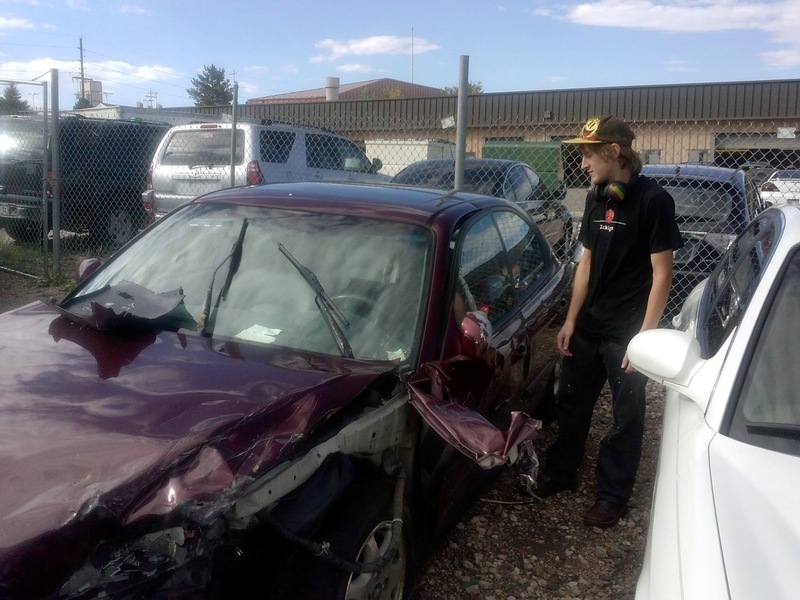 Based on the extent of the damage I don't think he even slowed down when he started the turn into Alex's lane. I believe many of you know that I live in Colorado. I have been relatively unaffected by the rains that have been falling pretty steadily for the past five days. I have kept a close eye on my family that live here as well as we have been quite fortunate to escape major damage at this point. I came across a gallery of images though that show just how damaging this series of storms has been to the area. 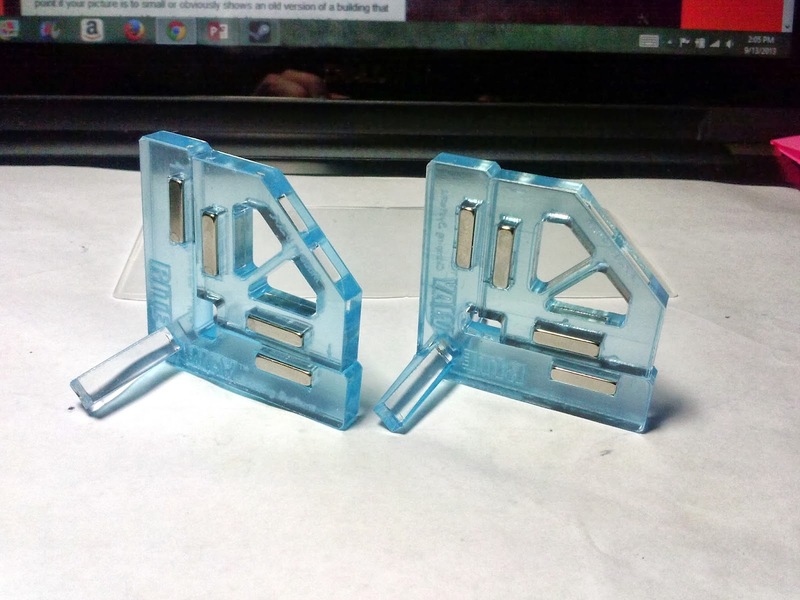 I have been looking for some replacements for my corner clamps. They are old, and a little awkward to use. 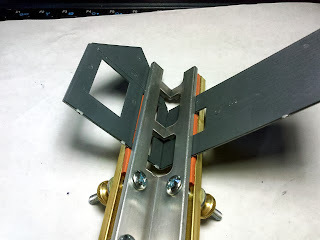 I needed something that would clamp together and still let me add glue easily to the joint. 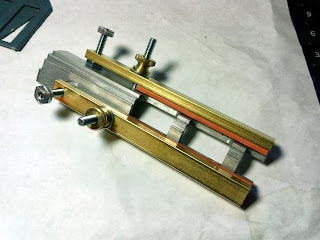 Well I found a couple of possible replacements on my favorite tool site; Micro Mark. I don't really have anything to use them on at the moment so I grabbed a plastic kit just to see how I might be able to use them. 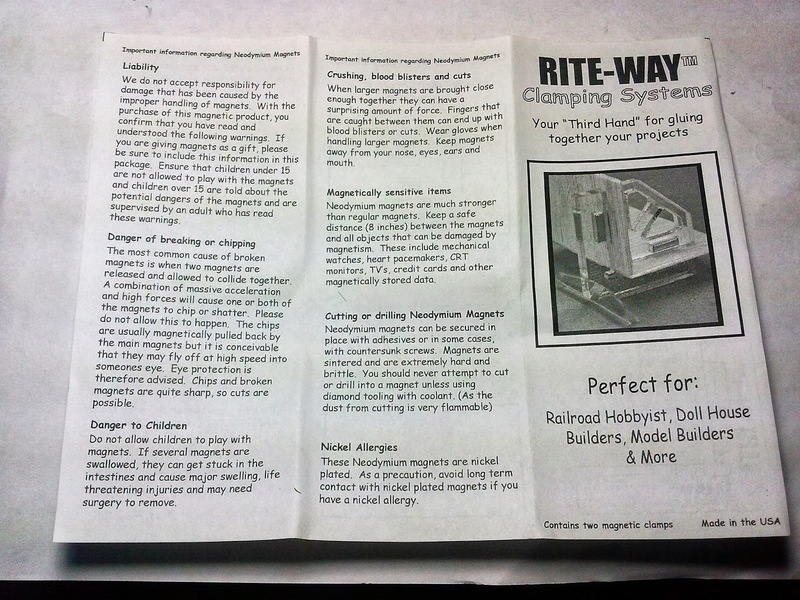 I'm curious to find out how thick a piece the magnet Rite Way clamps can handle in reality. 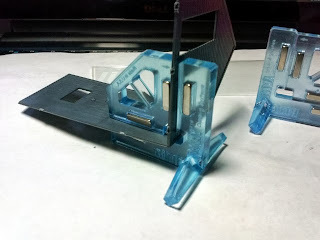 I didn't have a problem with the thin plastic of the kit, hopefully they will work just as well through mdf and plywood. The big right combo clamp should come in handy for those thicker pieces. I'll need to get another one when I get another paycheck under my belt, yea these were that expensive. With the introduction of a western building line from 4Ground, there are now six major players in the laser cut western building market. And since my original post Tri City Laser buildings, sold through Knuckleduster, have completely re-designed their line. That means its time to update my original western building comparison post. There may be some other companies out there that I'm not aware of and if you know of another manufacturer feel free to let me know about them and I'll add them to the list and try and order a building or two from them. I'll start with an availability chart of the currently available buildings from each manufacturer. Please exercise some care when using this chart it distills the buildings from each line into some pretty narrow classifications and what the buildings in that classification cost. To truly know what you are getting you need to visit the company's website and look at their pictures and drawings. A quick disclaimer; no company has paid me or sent me buildings for free, I have purchased every building that I have built and reviewed. This is a long post so grab a beer or a whisky (and I do mean Scotch), settle in and get comfortable. All manufacturer websites are not created equal and that is definitely true of the six manufacturer websites listed below. I work as an IT professional (no I'm not a developer) so I do understand about bandwidths and costs but if you are really trying to sell something to me I need a picture, preferably more than 1, that is bigger than a large postage stamp (and sometimes a small postage stamp at that) or at least a link to bigger pictures. 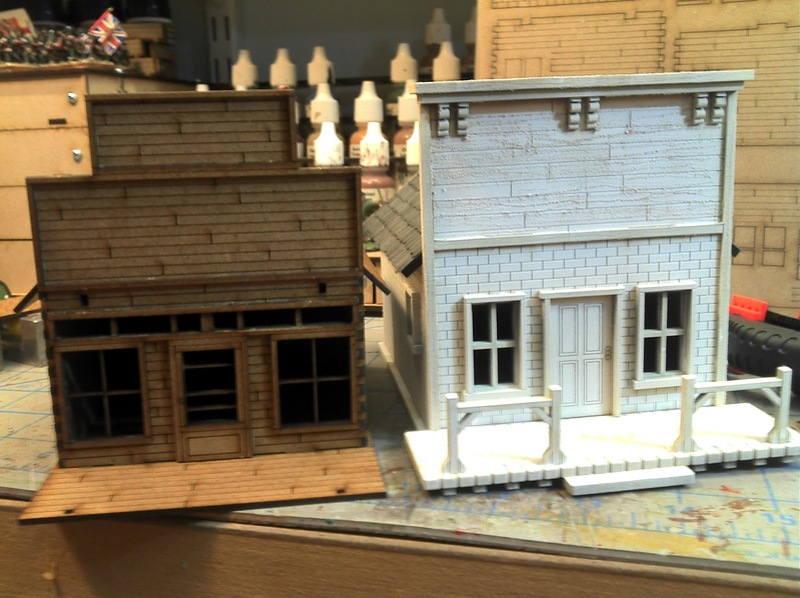 With the number of buildings that I have for my town of Calamity I'm getting pretty picky at what I'm going to buy at this point if your picture is to small or obviously shows an old version of a building that has since been replaced I'm not going to buy it. Also concept art is fine but once you have the building in production that concept art should be replaced with a picture of the actual model. After the chart I'll give some pros and cons for each manufacturer's buildings and other accessories they have available (although the accessory comments will be brief). I will not be covering cardboard or foamcore buildings. While many will insist that they are much cheaper by the time you have finished printing everything out and assembled it you probably could have been long finished with a laser cut kit and have something that is going to better survive the rigors of both gaming and transport. 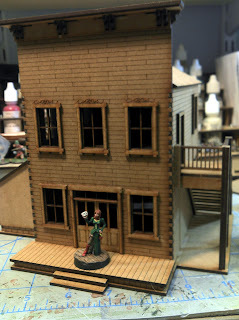 I certainly realize that there are plenty of people that love their cardboard and foamcore buildings and I will be the first to admit that they can and do look great on the table, they are just not for me. 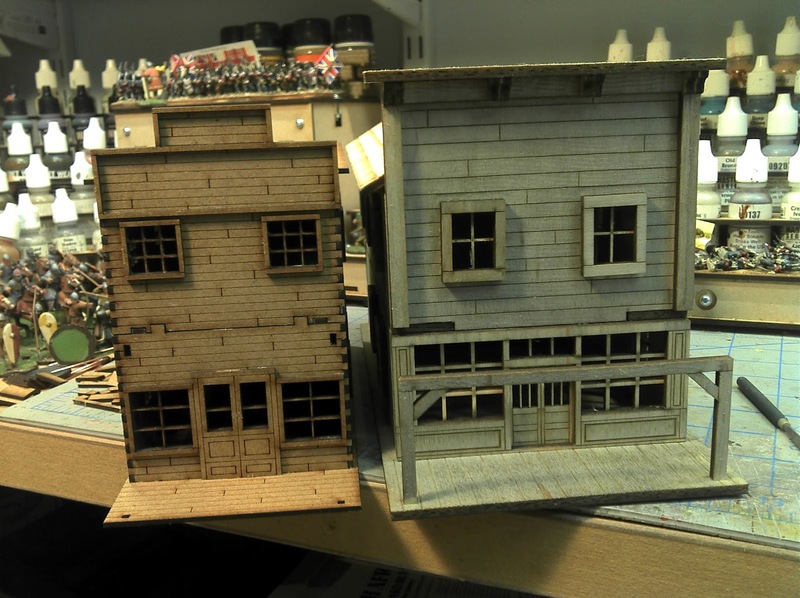 If someone were to do a comparison like this to the cardboard/foamcore world I would be more than happy to link to it. I usually get some comments and messages about why not just scratchbuild my western buildings. Well why not? 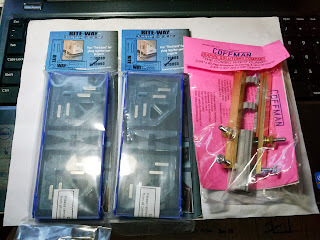 I do enjoy scratchbuilding, quite a bit, despite evidence to the contrary. The reasons to build or not to build are going to vary from person to person. For me time is just to precious right now and I want to spend it working on what I really enjoy. Despite some comments I have seen on other boards the majority of western buildings really are quite simple, most of them are not much more than a box with a big false front (and sometimes not even that) and a roof. 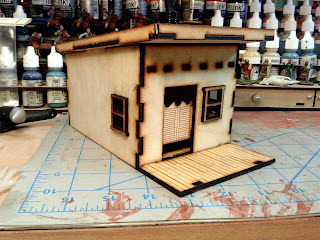 I don't want to spend my time scratchbuilding a box with a roof, I would prefer a kit for that. 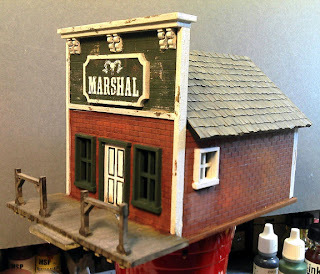 If I'm going to scratchbuild a building I want it to be something I can't buy off the shelf and is something that I truly want to spend some serious time on (that's the model railroader coming out). 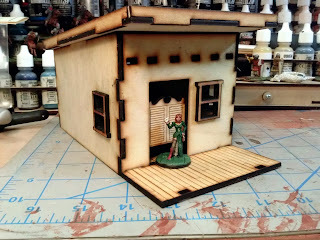 There are only three buildings in Calamity that I have earmarked to be scratchbuilt, all have more than one unique aspect and are not likely to be available commercially (or I don't like what is commercially available) and are structures that I actually want to spend time building. 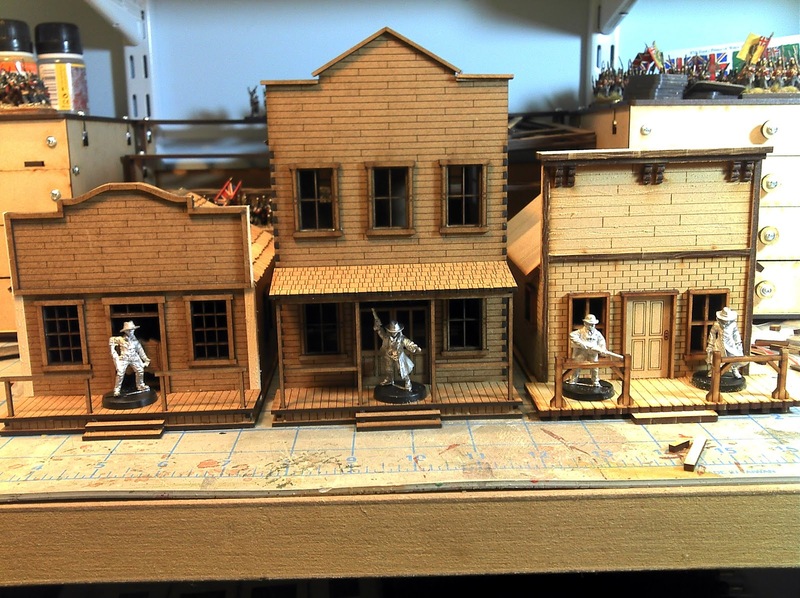 All three will be a centerpiece building for a different section of the Calamity game boards. I want to spend serious time on those buildings because I expect a lot of action to be centered around their locations and the buildings around them are going to be a lot more like bit players, the supporting cast as it were. 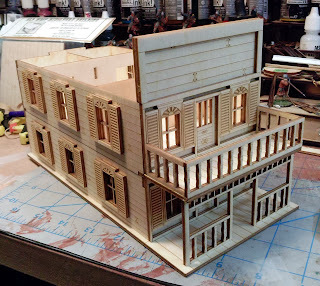 Well enough ranting and explaining, time for the real meat of this post; the good, the bad and the ugly of laser cut western buildings. First the Chart. 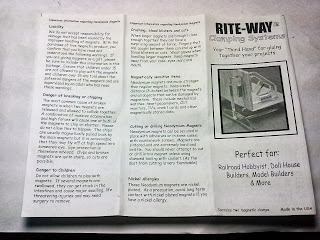 I have listed the manufacturers in alphabetical order and I had to split the table into two pieces so it would show up better on the blog. So if you don't see the company you are looking for scroll down. This shows which building types a manufacturer has available and an approximate cost (as of August 2013). I have tried to keep the number of categories as small as I can but there is still a lot of information here. For more information I highly recommend that you visit the manufacturers' websites (which follow after the chart). Now to make it easy for you here are the home pages for the manufacturers. 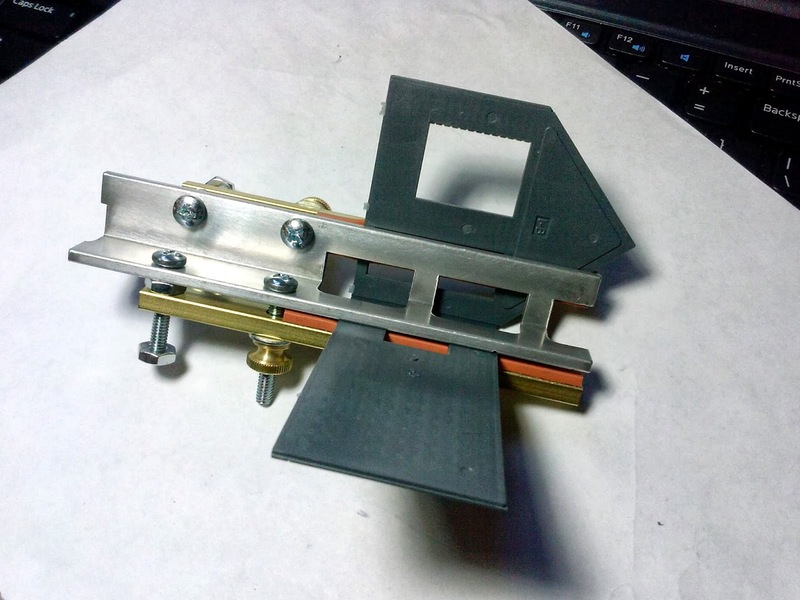 There are a number of different factors I consider when I’m building a laser cut kit. It doesn't matter if it’s Old West, WWII, ACW, ECW/TYW all laser cut kits are basically the same only the exterior detail tells us what period it is from. 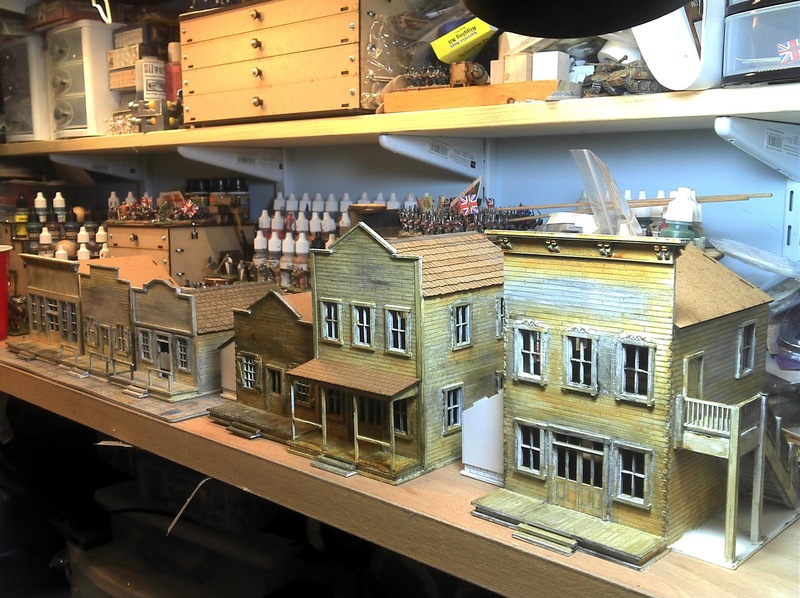 Obviously all my most recent work has been with the Old West kits. The factors I consider are: material, instructions, ease of assembly and level of detail. With the exception of material everything else is my opinion, your opinion may vary and you are certainly welcome to it. This is the newest entry into the Old West building niche. I have been waiting for 4Ground to launch into this field and the quality did not disappoint me. 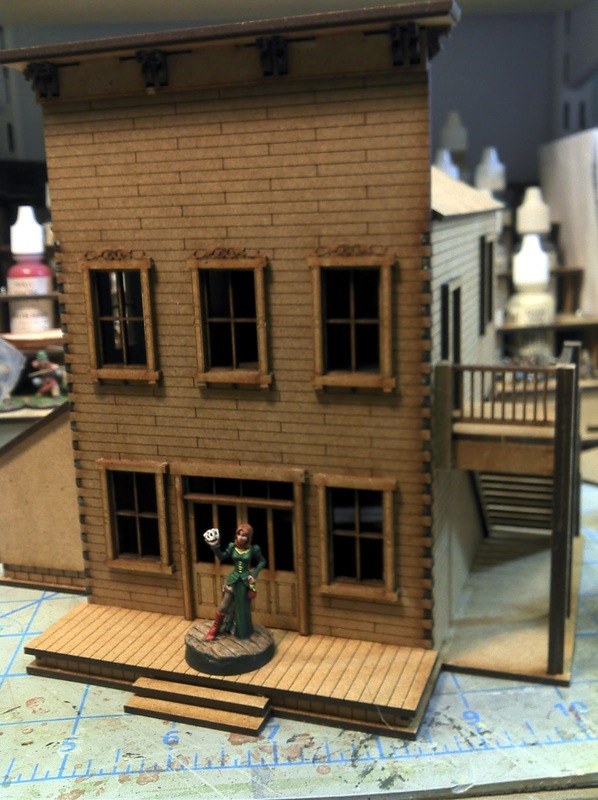 Great Escape Games partnered with 4Ground to support the Dead Man’s Hand western rules with a line of buildings. These build into very solid structures. They are the only company to provide both interior and exterior detailing (beyond the floor). They do this by making double walls. 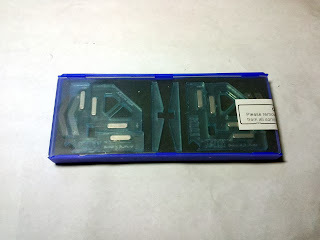 This makes the initial assembly a bit difficult to master as sliding the interior walls into place can be difficult, but it makes for a virtually gamer proof building. There are some other fussy assemblies as well, like the opening exterior doors (the interior doors are just glued in place, I wish the interior doors opened and closed) and the windows which all consist of at least four pieces. These buildings come pre-painted which means they are ready to go straight to the table when you are done. There are no options for getting pitched or flat roofs its already set in the kit. However, because all of the buildings share the same footprint all the roofs are interchangeable with each other. 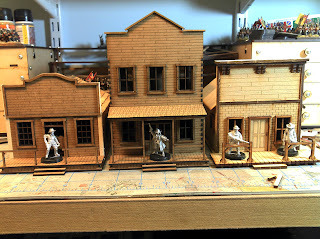 In fact all the second story buildings can swap the upper story around as well so there are a lot of combinations that you can come up with to vary the look of your time with just the six main kits. All the buildings come with a foundation that can be used or not used as you desire which adds even more flexibility to them. 4Ground doesn’t have much in the way of accessories at this point although they do have some nice wagons (General Purpose Wagon and Ox Cart in particular). I highly recommend these buildings. I really like these buildings out of Australia, I would own more but the shipping between Australia and the US is truly awful. They have a couple of excellent deals and for a while they also had an international deal on shipping. If you don’t live in Australia drop them an email and see if they can do something to relieve the pain of shipping. The exterior detail is very good, on the interior only the floor has detail. 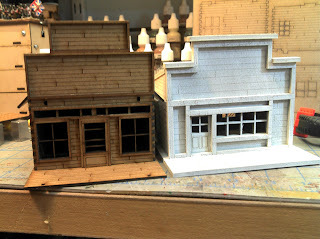 The line is not extensive but there are enough differences between their buildings to make up a small town. 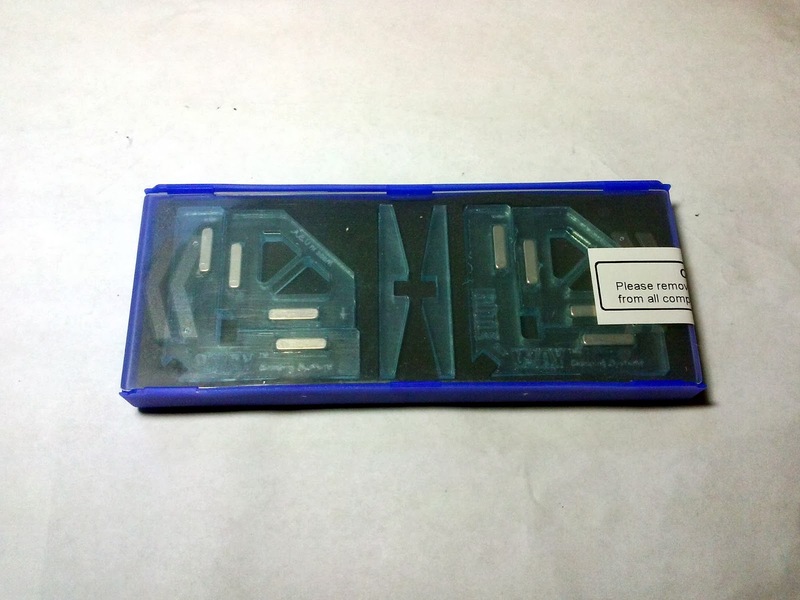 They also have a unique, “building under construction” kit which makes a nice addition to any gaming board. They are a little on the large size in appearance but do match up well with buildings from other manufacturers. Currently their two story buildings do not split apart at the second floor and do not come with any internal floors. They are in the process of re-designing these kits to be more game friendly.They have a really nice line of accessories as well, although their wagons are a bit on the expensive side. The line also includes alternate styles of windows and doors so you can take the small wood building and dress it up four different ways. I'm not thrilled with the puzzle cut edge on these buildings though. Although it creates a very strong joint I find it quite a distraction because that's not how the corner of a wooden building should look. 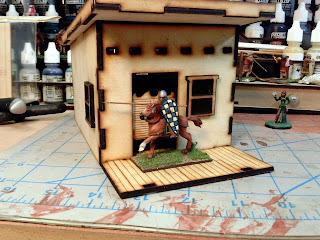 I had trim to all of my Battle Flag buildings to cover the corners. This would be a great corner if the building was brick or stone. This is another line that I would highly recommend, at least if you can handle the shipping. And if you are Australian I think you can build up a nice town with these without breaking the bank paying for shipping from the US or the UK. Battle Flag buildings were the first buildings that I put together and they are still my favorites. The exterior detail is excellent and they will use different thicknesses of MDF to build up intricate detail. Because of this a couple of the kits are a bit more involved to assembly than others. Other buildings are quite simple. All of the floors have engraved detail and the first floor in all of the buildings “floats” above the building base so the floor matches the height of the raised boardwalk in front. The instructions are well written and have a lot of pictures as well. 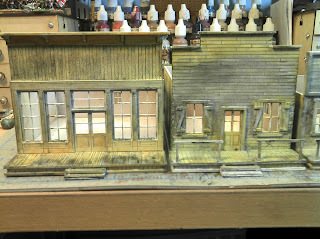 The two story buildings do not come apart into two sections, rather the interior second floor is removable. This is not ideal for gaming, especially if you have action taking place on both floors at the same time. I’m thinking that one solution to this problem is to make a shell for the second story that slides into place. 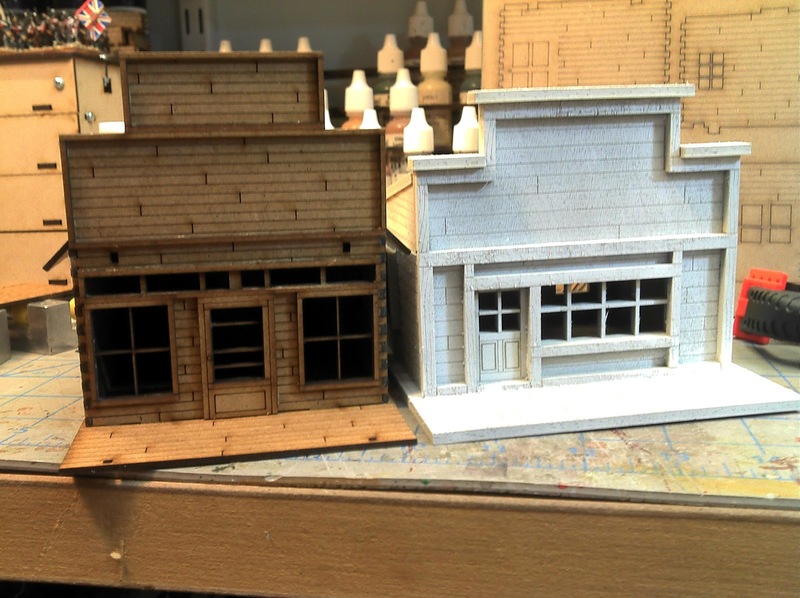 All of the buildings come with a pitched roof, although they do have a line of inexpensive flat roofed buildings (four of them all quite distinct) that are a good start for any town. Battle Flag has little in the way of accessories. I highly recommend this line of buildings. I believe that this is the oldest line of buildings among the six manufacturers. They are primarily designed as terrain and not for action to take place inside. 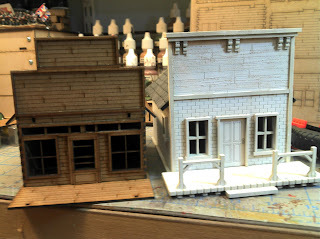 The smaller one story buildings work well, although you have to buy the floors as a separate piece. The same with the two story buildings (remember to buy two floors). The issue with adding floors that except for the front door the other doors are placed even with the bottom edge of the building (watch your step going inside!). The exterior detail is good, a little on the chunky side due to the thickness of the MDF being used. There is no interior detail not even the floors are engraved. With a little bit of work these can be turned into nice buildings just remember to buy the floors when you buy the buildings. Gamecraft has an extensive line of accessories; including signs, fencing, furniture and even a wind driven water pump. Although I consider the buildings to be average their accessories are definitely worth taking a look at. Sarissa has the largest selection of buildings of any of the manufacturers and they also use the thinnest MDF as their standard thickness. This makes some of the detail on the buildings quite fragile while you are in the middle of the build. I have also run into a minor quality problem with Sarissa. Sometimes they will get a sheet of MDF that is out of spec. 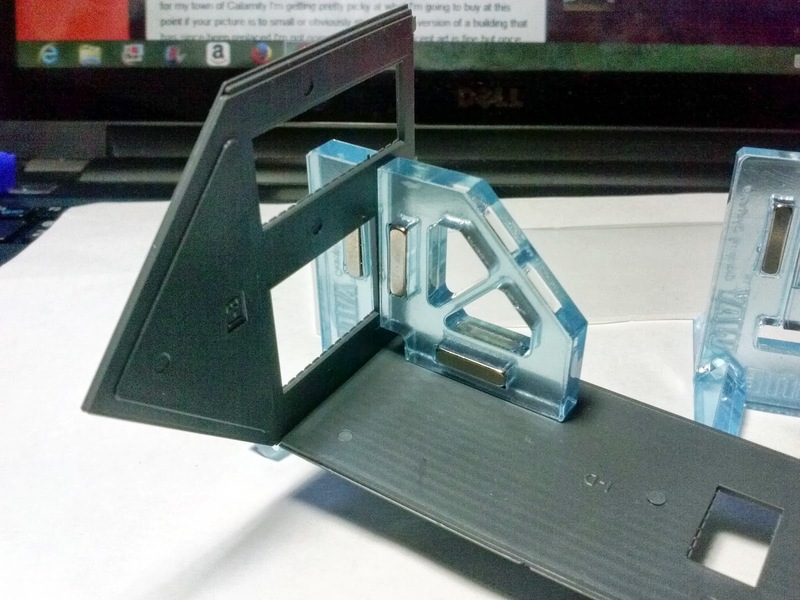 If this happens the tabs on the piece will not fit well (if at all) into the matching slot. You need to file down the tabs a bit to make things fit. However, this is not a common problem and most of my buildings went together with no real effort. The exterior detail is excellent (although the rock faces on chimneys could be better) the interior detail is limited to engraved floors. 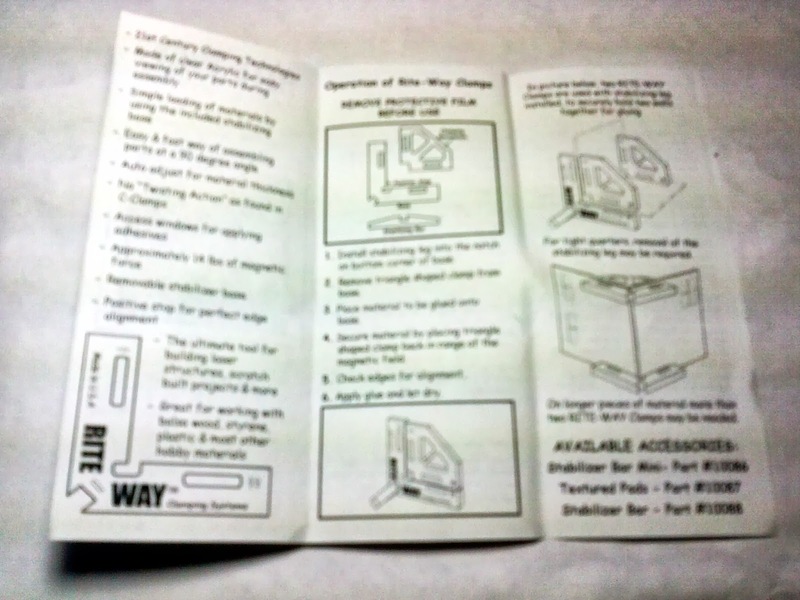 Instructions are typically a single sheet showing a kind of exploded view of the building. It is usually good enough to be able to put the building together 90% of the time. The variety of accessories is not huge but they have some nice ones. 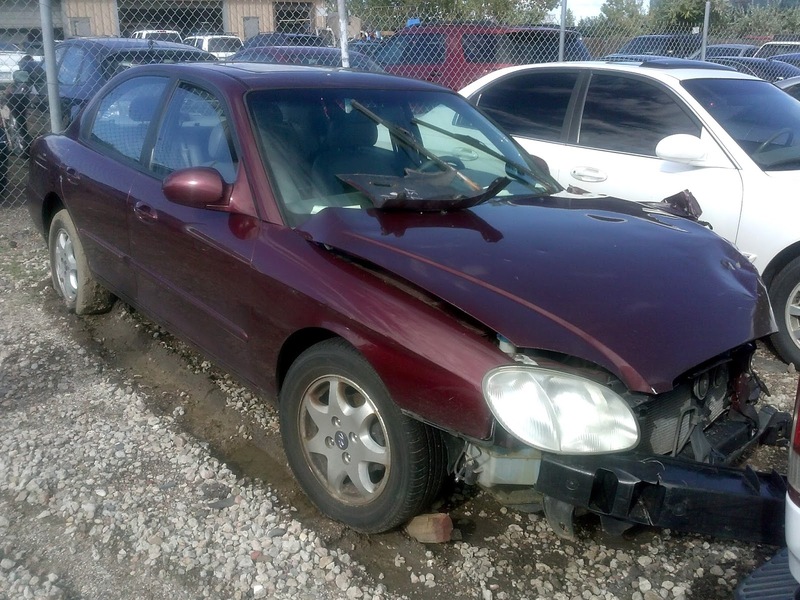 If you need to get a old west town together fast and your budget is a little tight this is the line to go with. 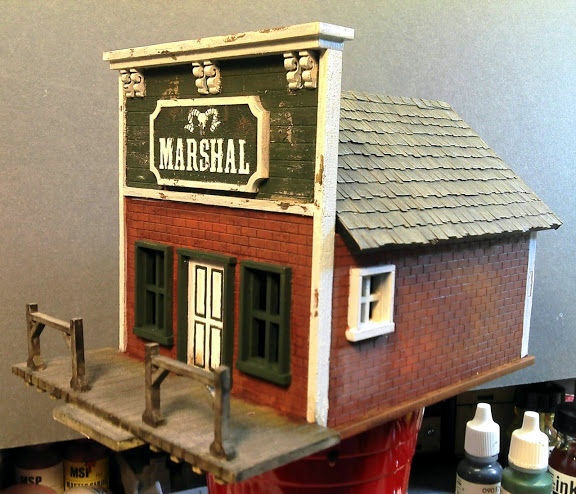 All Sarissa buildings come with flat roofs, you can get Pitched roofs as an upgrade. The line of Large Heroic buildings only come with flat roofs. 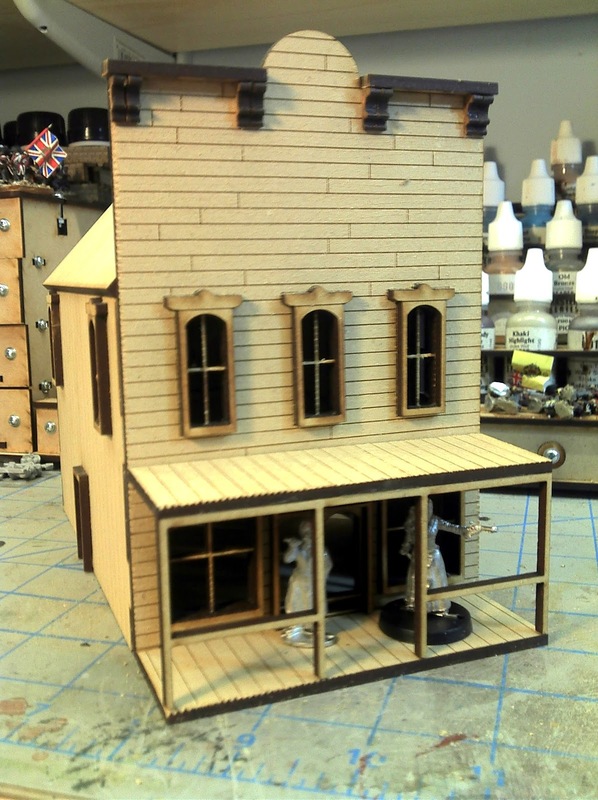 While Battle Flag and 4Ground are going to be my first choice for standout buildings, Sarissa fills in the supporting building cast. 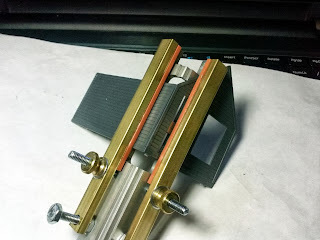 Another highly recommend line, with the caveat that you should check the thickness of the MDF in the kit and dry fit it together to make sure there won’t be any fitting problems. 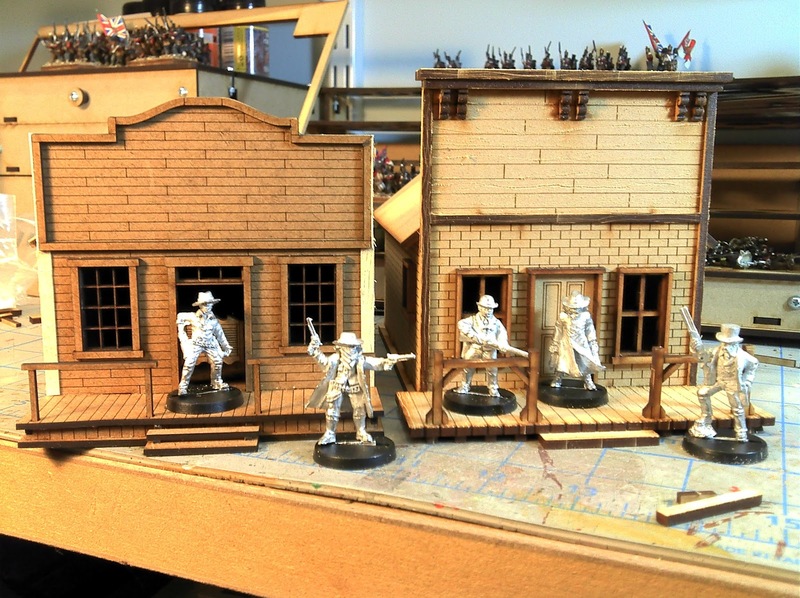 Sarissa also uses the same puzzle cut fit at the corners, so all of my Sarissa buildings get some added trim to cover this. I have waited to do this review until I was able to build a couple of the newly re-designed kits from Tri City. My previous objections to Tri City were the clunky, squat look the buildings had mostly due to the thickness of the plywood. And despite advertising interior detail this was restricted to furniture and the floors were lacking any kind of engraving. Tri City has gone back to the drawing board a bit and given me just about everything I wanted. Thinner plywood resulting in a lighter looking building that no longer has that squat (well mostly) look. The interior floor is now fully engraved and he is working on a new wood pattern that will have engraved wood grain. They have also reduced the size of the furniture, like shelves and counters and they are not nearly as overwhelming as before. I had hoped for instructions as well but this, apparently, is going to remain a sore point with me. While most of the buildings are quite straightforward, the two story buildings, and in particular interior stairs really need better explanation of how things should fit together. With the new slimmer look they fit in much better with the offerings from other manufacturers. All Tri City buildings come with flat roofs. You can buy slanted (for small buildings) and pitched roofs (bigger buildings) as an upgrade. 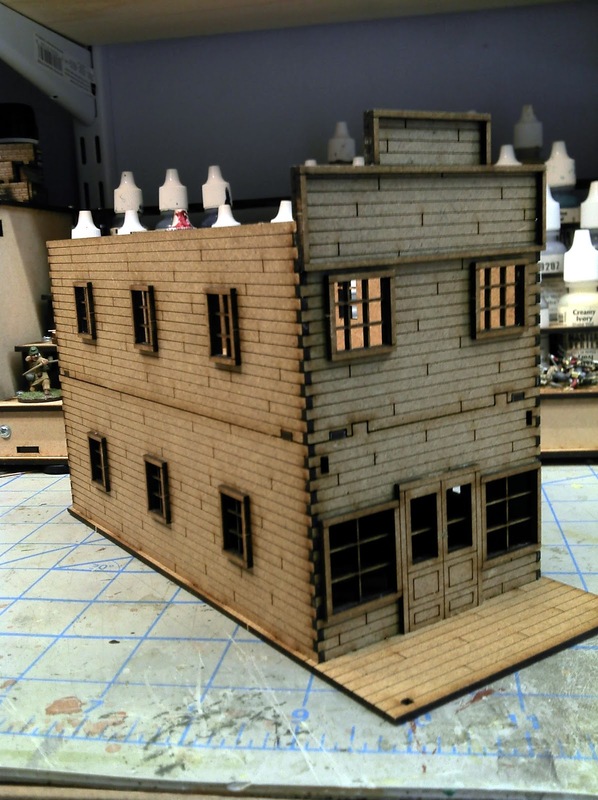 The use of plywood makes for a very solid building when its put together and the way the walls are joined together helps eliminate the checked look that other buildings have (Battle Flag and Sarissa in particular). The only issue you may really run into is the grain. If the grain of the plywood is going against the “grain” of the building it will be hard to weather unless you prime it first to kill that grain. While I won’t give these my highest recommendation they are a solid choice and they should stand up quite well to the rigors of the gaming table. A Question of Scale - Read at your own Risk!